Apple has shown continued interest in creating digital avatars for its Game Center networking service for iOS, with a pair of new patents related to automatically generating an avatar and also updating their online status. One of the new patent applications published this week by the U.S. Patent and Trademark Office, dubbed "Automatic Avatar Creation," describes a 3D character that can be automatically generated from a picture or video frame. 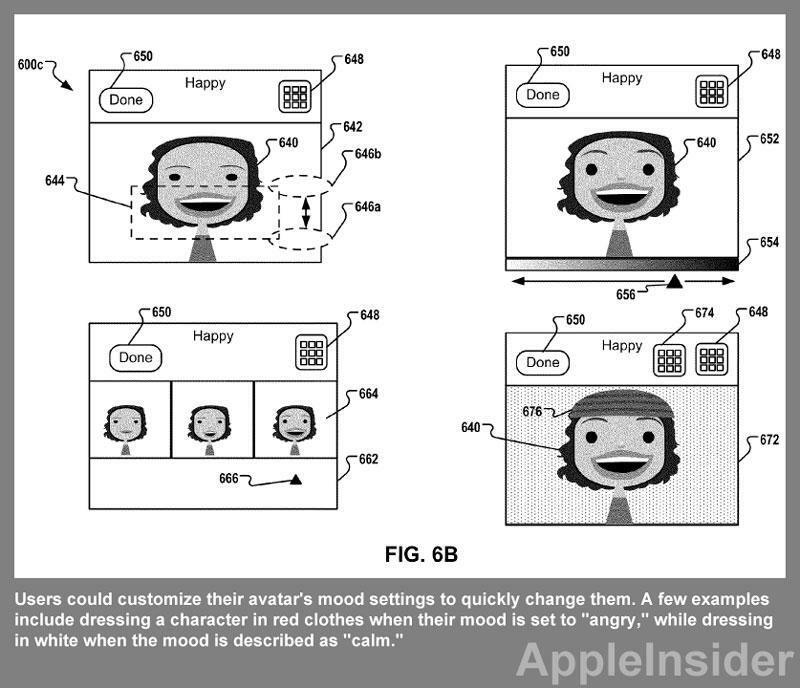 The application, discovered by AppleInsider, describes a system that would create a digital, cartoony version of a person based on their picture. Once an avatar has been automatically generated, the users can further customize their digital character in an editing environment. Once completed, this character could be used for gaming, social networking and video conferencing. The most prominent example provided by Apple in the application is using the avatar to represent a person in an online gaming environment. Apple's Game Center social network, which allows users to friend one another, track achievements in games and challenge each other to online match-ups, would be the most obvious implementation. Digital avatars have become a common aspect of gaming platforms in recent years, popularized by the Nintendo Wii and its customizable "Mii" characters. Nintendo was soon followed by Microsoft, which added cartoon-style avatars to its Xbox 360 interface, and Sony, which took a more realistic approach for characters in its PlayStation Home service. 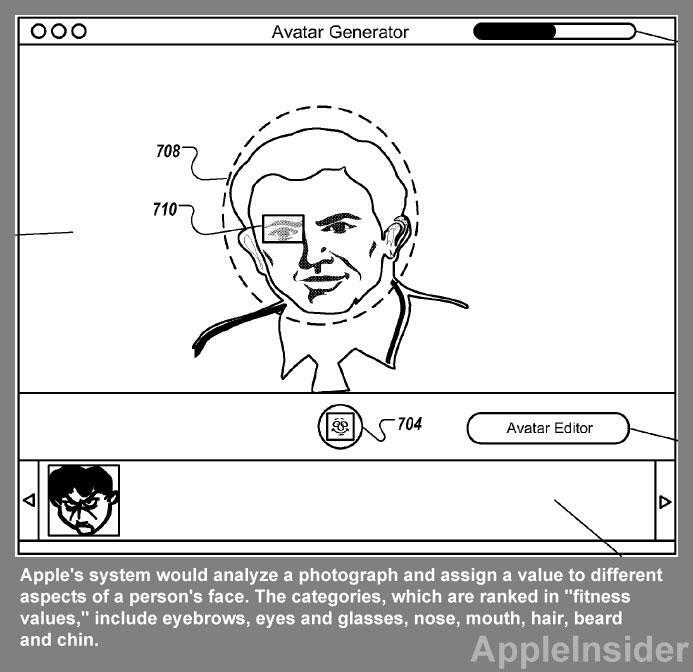 Apple's application describes a system that would analyze a photograph and assign a value to different aspects of a person's face. The categories, which are ranked in "fitness values," include eyebrows, eyes and glasses, nose, mouth, hair, beard and chin. "Once the fitness values for the facial elements are computed, an overall fitness of the genome can be computed as a function of the individual facial element fitness values," the application reads. Among those credited for the proposed invention is Bertrand Serlet, the former senior vice president of software engineering at Apple. Others credited are Ale Tremain Nelson, Cedric Bray, Thomas Goossens, Merwe Rudolph Van Der, and Richard E. Crandall. The application was first filed in June of 2010. A second application was also published this week by the USPTO related to digital avatars for Game Center. Entitled "Avatars Reflecting User States," it describes different ways that an avatar can be modified to represent a user's current mood or status. An avatar could be customized by its owner with a "trigger event," which could include user-entered textual data or emoticons. It could even change a user's status based on data on the phone; for example, when it is someone's birthday, their avatar might be shown with a background showing balloons and fireworks. Users could customize their avatar's mood settings to quickly change them. A few examples include dressing a character in red clothes when their mood is set to "angry," while dressing in white when the mood is described as "calm." The user state could affect more than the character's appearance and clothes, and could also include "presentation themes." For example, if a user indicates they are "happy," cheerful music could be played, while a "sad" avatar would be accompanied by melancholic music, and "bored" could be accompanied by a snoring sound. The proposed invention is credited to Goossens, who appeared on the previous filing, as well as Laurent Baumann and Geoff Stahl. It was also filed in June of 2010. Apple's latest pair of applications are not the first time the company has shown interest in avatars for Game Center. Back in October, AppleInsider revealed the company's interest in creating cartoon characters for game players on iOS devices, much like Nintendo's Miis. The applications published in October described an interface in which users could create custom, cartoon-style avatar characters in Game Center. In those examples, users would start with a blank canvas and choose basic features like hair, a nose eyes and a mouth to create their character. Accessories like hats or glasses could also be added. But this week's latest applications are all about simplifying that process, and automating the creation of a character as well as updating its status.